Indian saree is an unstitched long piece of cloth usually five to six meters. Saree is wrapped around the body with one end tied around the waist and the other end called “pallu” neatly draped over the shoulder. Sarees can be draped in a variety of styles, with each style having its own uniqueness. The basic difference lies in the manner in which the pallu is wrapped. Pallu is meant for show and thus is decorated beautifully. Sari is worn over blouse (also known as a choli). Underneath the sari one wears a Petticoat: – a waist-to-floor length skirt, tied tightly at the waist by a drawstring. Blouse saree are usually are in silk, cotton and velvet fabric. There can be different styles of blouse cuts like boat necked, square necked, blouses with straps. Since time immemorial, Sari has been the most popular costume. It is an ideal clothing for the Indian culture, religion and climate. And is preferred by the Indian women because of the elegance and comfort it offers. 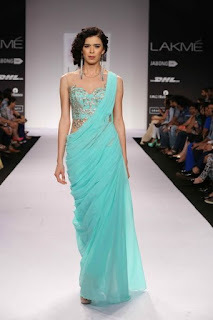 Sari fashion highlights the beauty of women in the most graceful and natural manner. Indian saris maintains the very essence of our Indian culture. Indian sarees come up in a variety of sari fabric, exquisite styles, beautiful prints,exclusive embroideries like Zari, Resham, beadwork and studded stones with a palette of rainbow colors. Designer saree is very in. Sari is a dress for all seasons and virtually all occasions. Indian Wedding saris is a super hit among brides. It is considered to be the most perfect dress for the wedding day. When worn with proper fashion accessories and jewelry, Saris can do wonders to the charm of the bride. Sari is for all-purpose – party wear, daily wear, bridal sarees and so on. This designs will help you to make your own sarees for wearing at any occasion. Many times in market we see same collection and get confused what to wear. This blog will help you to overcomes this problem. This saree has three colors Mustard yellow, grey and printed flowers on pleats. This saree looking very different because it has border pattern at bottom, printed pattern at middle and combined with pure grey color on both the sides.